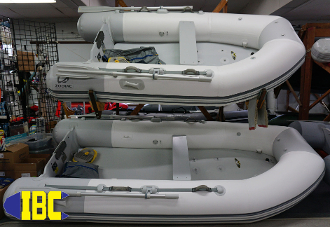 This inflatable boat package includes a Yamaha F9.9Hp and 3 gallon fuel tank. The new Zodiac Cadet FR 360 Acti-V inflatable boat is the ultimate when it comes to performance and portability. With plenty of room, large carrying capacity, and incredible performance, this boat is still portable. The Zodiac 360 Fastroller is a great choice for a portable primary boat or a dinghy when friends and extra crew come along. Compare to a MK2 Classic or Futura for interior space. With it's setback transom and deleted cones coupled with a blunt nose design you gain substantial interior space on a smaller boat. A favorite for the yachtsman, RV, or weekend crabber this is the epitome of easy to setup and light weight. Simply unroll and inflate there is no floor assembly required! The Zodiac 360 Fastroller features Genuine Zodiac Duotex Fabric (not that cheap offshore stuff) in an all welded boat. Often copied by "other brands" but never duplicated due to it's superior materials and construction techniques. The Zodiac 360 Fastroller even features a high pressure integrated keel in an actual keel shape that inflates at the same time the floor is inflated. More space,better performance, better materials and crafsmanship with a full 5 year warranty it's no wonder why we sell out of this model so fast! These boats include oars, new and improved oarlocks, a quick fit bench seat, heavy duty foot pump, deluxe storage bag, and repair kit. Don’t forget the many optional accessories available for the Cadet models that will make your dinghy stand apart from all the others at the dock or on the beach!